Daily file photoCasey Humann, an engineer with Lake Dillon Fire-Rescue, describes some of the ways in which firefighters tackle wildfires in Summit County at the Summit Reads discussion in December 2012 at the County Commons in Frisco. Residents of Frisco, Dillon and Silverthorne may see local firefighters posted outside grocery and hardware stores asking for feedback over the next several weeks as Lake Dillon Fire-Rescue rolls out its first community survey in roughly a decade. “Periodically, we like to get a good measure of how our residents view the department and what their needs are to protect themselves, their families and their property from fire,” Lake Dillon Fire chief Dave Parmley stated in a release. The survey will examine both how the department is doing and how the community is doing in terms of safety and preparedness ahead of what is expected to be another long and difficult fire season. Officials hope to learn everything from how many residents in the district have smoke detectors and emergency kits to plans for wildfire events and the community’s impression of the district. Fire officials will use the feedback to sculpt their community outreach and education programs as needed. The survey will be conducted online and passed out in front of local businesses and at various community meetings over the next month. Fire officials hope to reach at least 300 respondents, though they acknowledge the results won’t be scientific. The survey is being conducted in-house and will only cost the district staff time, officials said. The project is part of the district’s strategic planning process, an in-depth analysis of all of the department’s operations and ways to improve for the future. Parts of the survey focus on wildfire preparedness, in a way doubling as public outreach and information gathering. Survey questions ask respondents whether they have a plan to reunite or connect with family members and an emergency kit stocked with supplies in the event of an evacuation. Others ask whether they have fireproofed their homes or implemented defensible space. 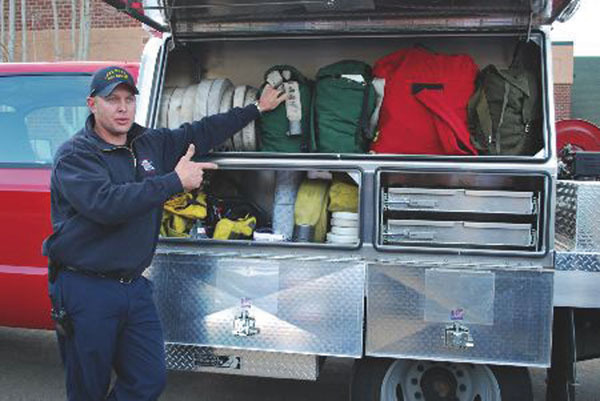 All are safety recommendations the local fire districts push hard during wildfire season. Fire officials say they hope the survey will also help draw local residents’ attention to the department’s non-emergency services, from home firesafety checks to car seat inspections. “We want people to know we’re here for them,” Lipsher said. The community survey is posted online at http://www.ldfr.org.